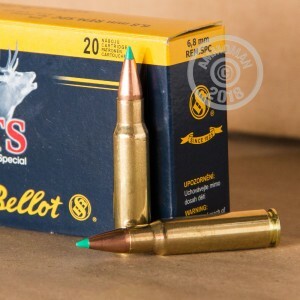 This polymer-tipped ammunition from Sellier & Bellot is a cost-effective, highly efficient hunting and defense load for 6.8mm Remington SPC rifles. Each cartridge in this box of 20 fires a 110 grain PTS ("Polymer Tipped Spitzer") bullet at a muzzle velocity of 2,549 feet per second. 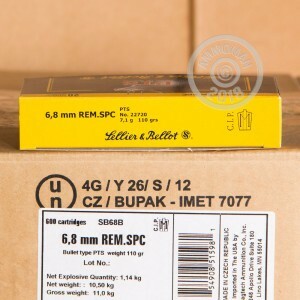 Sellier & Bellot ammo is made in the Czech Republic using non-corrosive Boxer primers and brass cases. 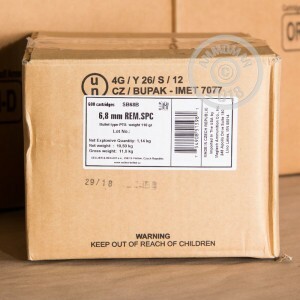 Make a great deal better with free shipping from AmmoMan.com--simply place an order for $99 or more!